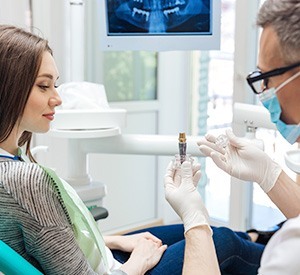 If you’re considering an advanced dental treatment like dental implant supported tooth replacement, the EPO Dental Specialists team members know you’ll have a lot of questions. Our caring dental specialists and team members are always happy to talk to you about your concerns, treatment options, and questions. Whether you’re in our office for a dental appointment or call on the phone, one of our knowledgeable team member will be happy to help. If we don’t know the answer to your questions, we’ll find it and get back in touch with you quickly. On this page, you’ll find the answers to some of the questions we hear most often from patients planning for dental implant tooth replacement. If you don’t see the question you’re looking for, please give our caring Richardson dentistry team a call today. We’ll be happy to help. Dental implants are small posts that resemble screws. When inserted into the gum line, these implant posts fuse with the gum line, mimicking the lost root structures of missing teeth. We can use dental implants to support any number of replacement teeth. What are Implant Posts Made From? Dental implant posts are available in a variety of materials that each have advantages and disadvantages. The longest used is titanium, and this material has been utilized in tooth replacement and bone repairs for decades. You can also receive dental implants crafted from a variety of materials, including metal-free zirconia. One implant – to support a single dental crown and replace one tooth or to support fused together dental crowns to replace two consecutive missing teeth. Two implants – to support a fixed bridge restoration and in rare cases to support small partial dentures. 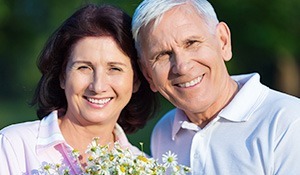 Three to six implants – to support partial or full dentures. How Long Does the Dental Implant Tooth Replacement Process Take? The implant placement and tooth replacement restoration can take several months to a year or longer to complete. The majority of this time will be spent simply waiting and monitoring the implant posts as they fuse with the supportive tooth structures. You will only need to visit our office for a few treatment appointments. How Long will Dental Implant Restorations Last? With proper care, dental implants will last two or more decades without need for repair or replacement. Many patients are able to maintain their implant supported tooth replacement for the rest of their lives. 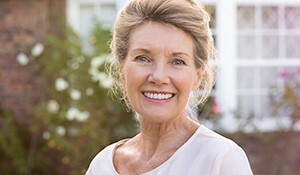 The cost of your dental implant restoration will vary greatly depending on a variety of factors, including, the implant material, the number and placement of missing teeth, need for preparatory treatments, and more. We will walk you through costs associated with your particular treatment plan, dental insurance coverage, and other factors that may impact the cost of your dental care. Before we get started with your implant supported tooth replacement plan, we’ll be happy to help you budget for your treatment.